For the sixth year in a row, TravelOnly has been recognized as an Ensemble Elite Top Producer. This year, the awards were presented to TravelOnly owners Patrick and Ann Luciani in Marrakech, Morocco. 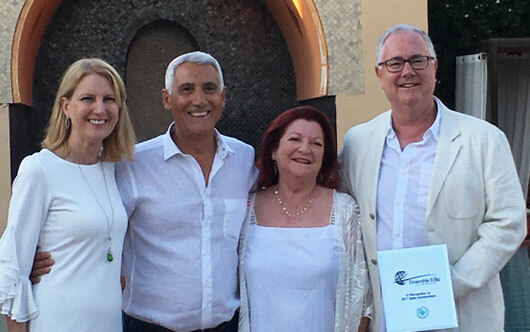 Over the past week, the top producing Ensemble member agencies from across North America joined co-presidents Lindsay Pearlman and Libbie Rice at the Club Med Resort Morocco and culminated in the awards ceremony recognizing the Ensemble Elite members. During their time in Morocco, the group participated in cooking classes, where they discovered some secrets of Moroccan traditional cuisine, enjoyed a unique night glow golf experience and networked with colleagues and preferred travel partners. Pictured (l-r) Rice, Patrick Luciani, chairman TravelOnly, Ann Luciani, chief financial officer TravelOnly, and Pearlman.